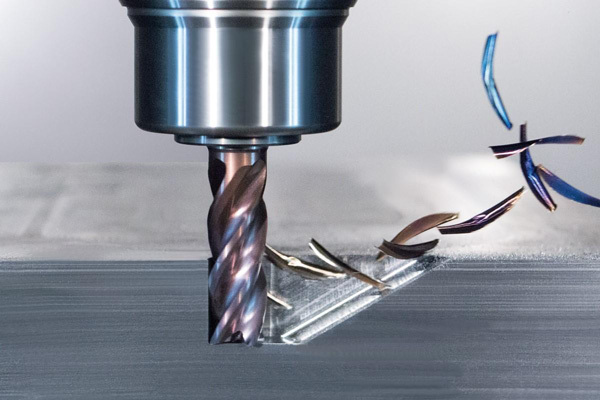 For customers with constantly changing tool requirements and a high demand for machining flexibility, Guhring has developed a new Ratio end mill that covers five operations with one tool: RF100 Diver milling cutter can perform drilling, ramping, slotting, roughing and finishing operations. Guhring’s new RF100 Diver milling cutter enables ramping, drilling slotting, roughing and finishing operations with one tool. Thanks to their unequal helix angle, Guhring’s RF100 high-performance end mills have been convincing with outstanding performance and quality for years. however, so far plunge milling up to a maximum 15º was the measure of things. Where competitors offer tools where ramping reaches their limits at an angle of 8º to 15º, RF100 Diver achieves a plunging angle of 45º. Thanks to this unique technical characteristic with the RF100 Diver a seamless transition from slotting to drilling can be achieved – and in most materials. Thanks to the steep plunging angle an enormous amount of material can be removed. At the same time excellent chip evacuation that is provided thanks to the optimised cutting edge geometry which results in high process reliability. Combined with the ability to operate at high feed rates the RF 100 Diver achieves high metal removal rates. When drilling, the RF100 Diver displays optimal drilling characteristics up to 2xD and also here is clearly superior to its competitors that start to falter at drilling depths below 1xD. RF100 Diver is the ideal pre-drilling tool for reamers. When slot drilling undersize roughing is performed and then the RF100 Diver finishes to provide a perfect fit. This allows the production of precision slots and grooves to all tolerances. A separate pilot tool is not necessary, as the Diver can drill and pilot drill in all diameters and on curved or oblique surface. Highest feed rates are possible for slotting – and this is already applied when plunging. RF100 Diver scores points for a high metal removal rate and undersize for precision slots and grooves. Despite high feed rates RF100 Diver maintains high process reliability and smooth operation. It achieves high operational smoothness thanks to its different helix angles of 36º/38º. The different helix angles ensure that any developing vibration resonance is absorbed. The unequal helix angle promotes vibration-free operation a swell as enables high feed rates and simultaneously reduces the undesired ‘grab’ effect or “corkscrew effect” during the milling process. The reduced vibration allows higher cutting rates thus higher metal removal rate. For roughing operations in steel RF100 Diver makes cutting speeds possible up to 100% higher than what is regarded as normal for the market. For finishing operations it achieves 100% longer tool life. Additionally the power consumption is reduced compared to conventional milling cutters thanks to the innovative geometry, that allos the application in unstable conditions and on less powerful machines. For finishing operations high cutting parameters are also possible in alloyed heat-treatable steels.